Thanks for keeping this going! It's a very interesting read. Nice to hear that people are still reading the AAR. Thanks for the kind words John! Status: offline Yes, keep it up....nice job! Yes, keep it up....nice job! Thanks Q-Ball. 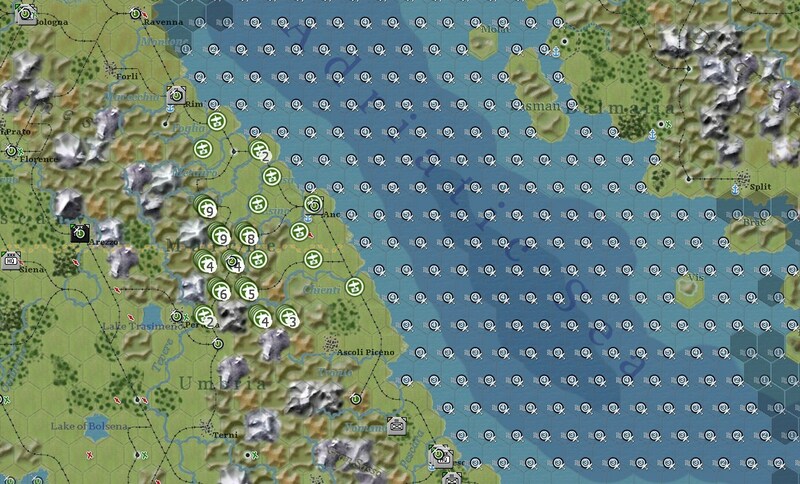 As far as I can tell my opponent has moved most of his 4E Bomber Groups to Britain so maybe it will be a couple of turns until the Allies start hitting Austria. I am hoping that next turn things are quiet in the air. The 8th Air Force has taken a heavy beating but the cost has been quite high on our side too. 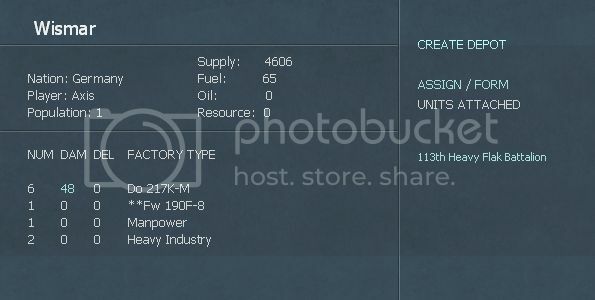 I turned the Pulia airfields into my air transport fleet. The ports fill up with freight, and I fly it forward up Italy. The heavy fighting in the last couple of weeks and a turn in the weather has forced both the 8th US Air Force and the British Bomber Command to stop operations over the skies of Germany temporarily. No cities in Germany were hit last week and our fighter wings get some well deserved rest. Weather forecast for next week is heavy rains, a welcomed sign of the approaching autumn. 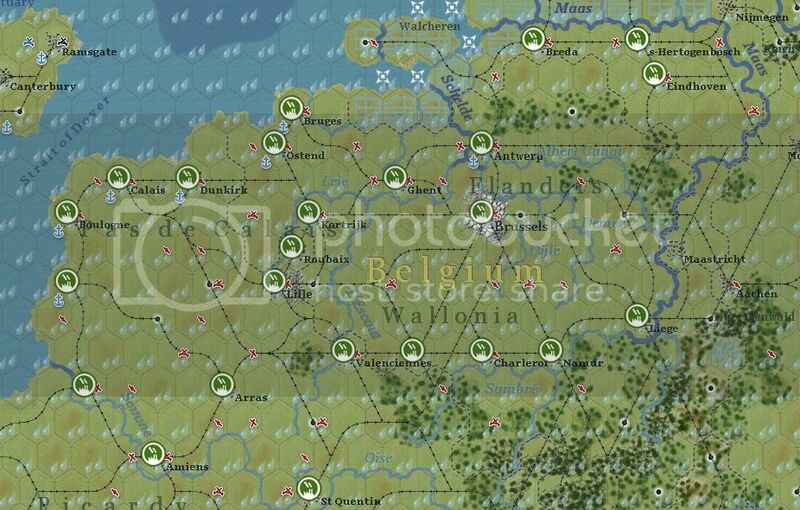 The Americans however use their fresh 2E Bomber Groups to hit marshalling yards and key railways in Belgium. They fly unopposed as this region is only protected by flak formations. Our bombers keep patrolling the sea lanes west and north-west of Rome. This whole area is under our control and recon indicates no air asset build up neither in Sardinia nor in Corsica. 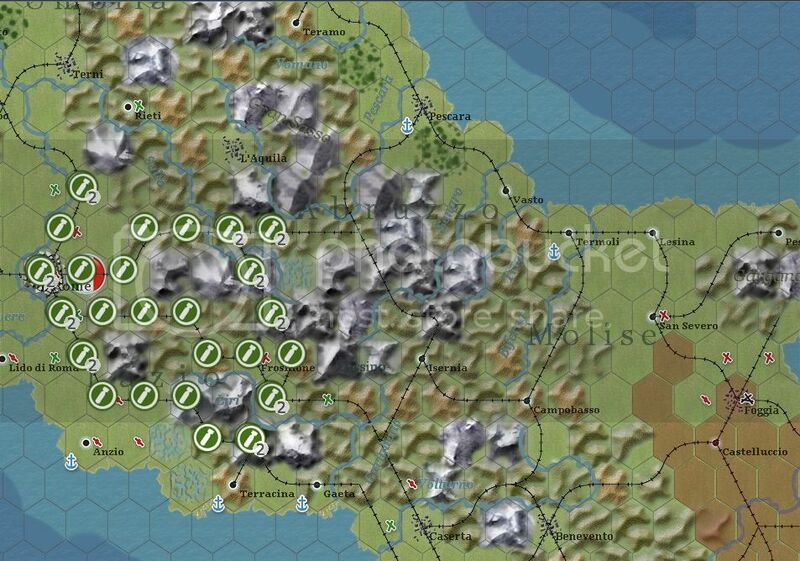 Instead most of the enemy air assets are located in the Pulia region. The enemy has hit marshalling yards and key railway lines in the area around Rome. Enemy recon seems to be concentrated on the area around Pescara and the front line. No recon flights were spotted over Rome. Meanwhile our Tactical Bombers are ordered to interdict enemy movement in the area around Foggia. The complete the task succesfully. The invasion still has not happened. The enemy has captured Foggia but still has not made contact with our defensive line. 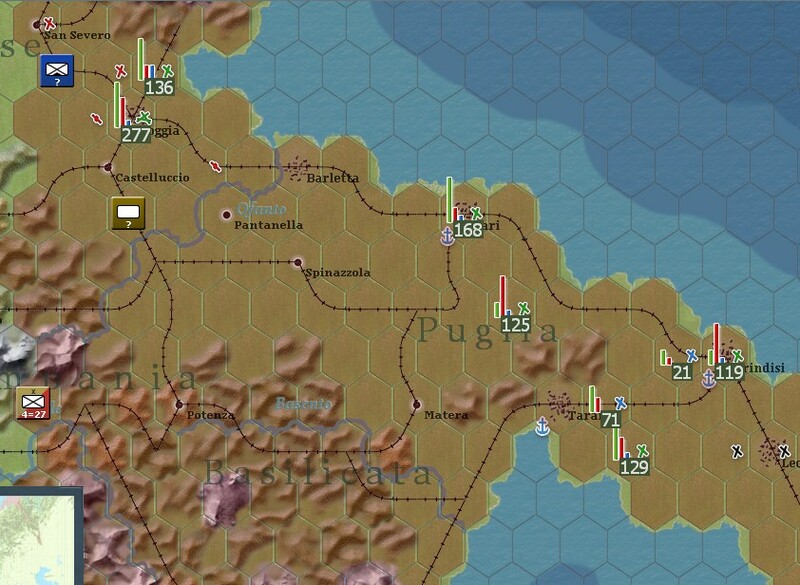 One Infantry division has been transferred to Napoli to relieve the 3rd PzGren Division and more infantry units are on the way. 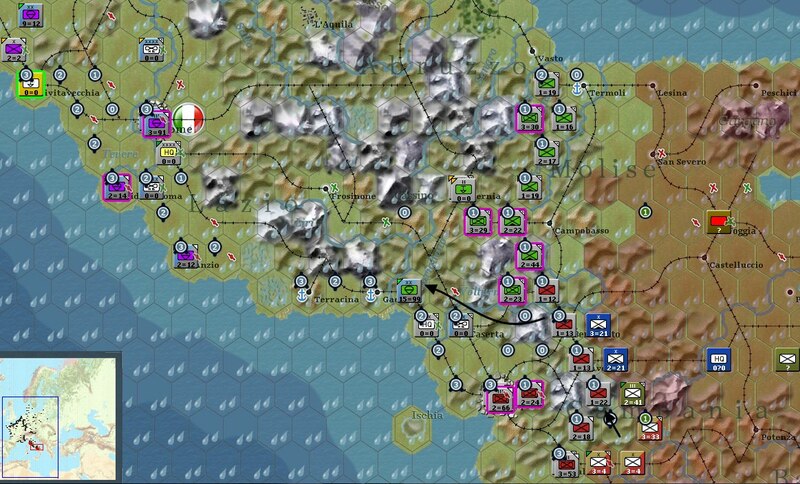 The plan is to create a fast moving reserve of PzGren Divisions to be able to counter any major attack on our main defensive line as well as to contain any possible Anglo-American landing. Circled in black, arriving infantry units. No changes in the defenses in front of Rome so far. 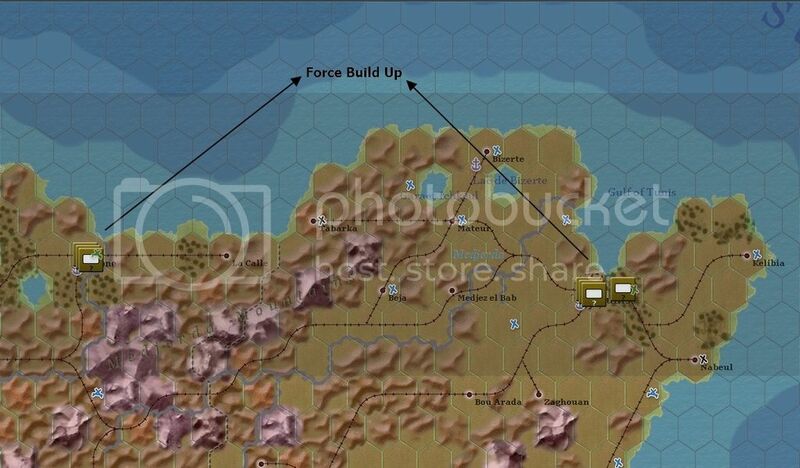 The 16th SS Sturm Brigade moves to Piombino to garrison the port. Weather is predicted as clear for next week. Yeah I did some rookie mistakes. Happens since its the first time playing the GC. I don't think it that way. The Allies do have an almost infinite amount of everything globally but you can force them to suffer local shortages. Anyway, time will tell if I am right. Thanks for the comment! Status: online Great read, your AAR. Thumbs up ! Great read, your AAR. Thumbs up ! 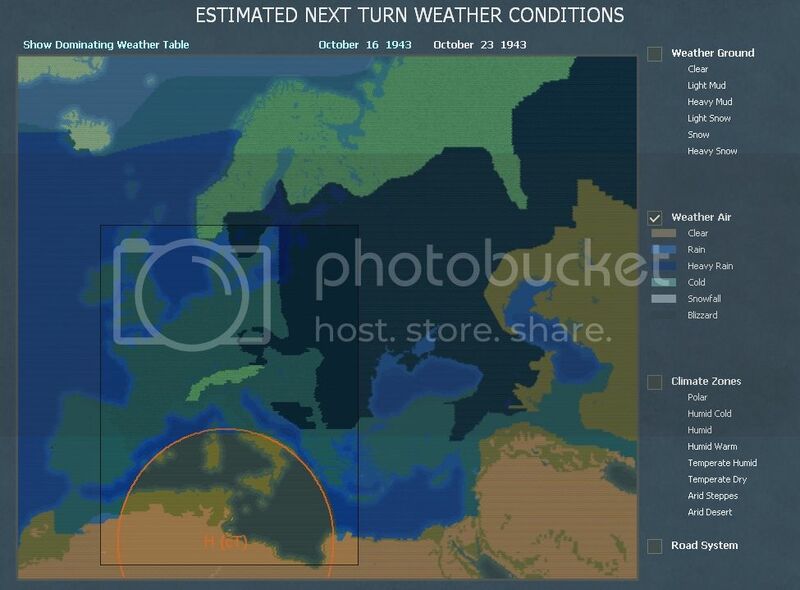 The weather predictions by our meterologists turned out to be incorrect. Instead of Heavy Rains we only had light showers during the week, allowing the 8th US Air Force to bomb Hessen, more precisely 3 main cities where truck production is focused: Frankfurt (15), Mainz (78) and Mannheim (10). The raids have caused extensive damage to the truck factories and priority repairs have been ordered for the factory at Mainz (the biggest truck factory in Germany). Their raids were composed of 120 fighters and 300 4E Bombers. Our fighter groups spaced far from each other suffered heavy losses during the interception, 97 fighters as well as 65 fighter pilots were lost . Nevertheless we inflicted losses on the enemy bombers and on the escorting P-38 Lightnings. 70 P-38 Lightnings were shot down as well as 106 4E Bombers. The results are by all means unimpressive and have forced us to reevaluate our air defense strategy. 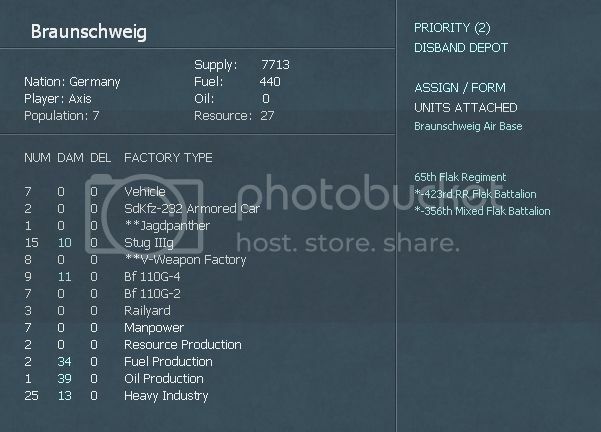 The OKL has ordered all day fighter groups in Germany to be on R&R for the week and home bases have been changed in order to group fighters more effectively. The fighters stationed in Rumania, East Prussia and Italy as well as night fighter groups are unaffected by these orders. Weather prediction for next week is: rain and scattered showers. 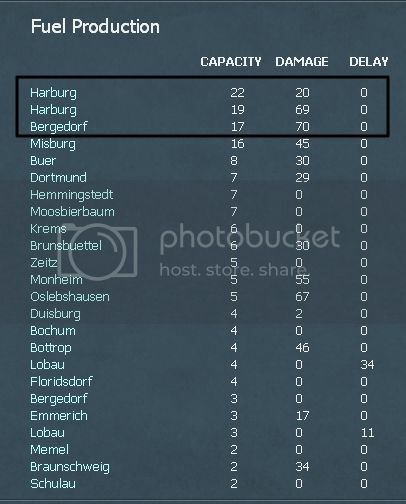 The WA target will probably be north Germany, where most U-Boat pens are located. No changes in the air war in Italy. We still have control of the sea lanes west of Rome and in the Adriatic Sea. Recon has picked up increasing numbers of planes stationed in the Puglia region and aircraft were also detected in Foggia. The Tactical Air Force bombed the airfield at Ciampino last week, destroying 9 Level Bombers on the ground. Units are moved around during this week, as part of the general defensive plan that requires the Bifena Line to be manned by infantry formations backed by mobile reserves. The 3rd PzGren Division is relieved by the arriving 266th Infantry Division. The 4th FJ Division is transferred to the Rome Defensive Area while the 157th Mountain Division is transferred to the Bifena Line. The 148th Reserve Infantry Division is transferred from Southern France to Italy. The Anglo-American landing has not happened yet. Weather for next week is predicted to be clear. The RAF Bomber Command hit U-Boat pens in the north and Truck/AFV factories near Hannover and Braunschweig while the 8th US Air Force hit the same truck factories as last week (Frankfurt, Mainz, Mannheim) knocking them out. This presents a serious problem as these 3 factories alone are responsible for 20% of all truck production. The Americans flew their sorties unopposed, due to OKL orders that forbid all day fighter groups from engaging enemy formations. The British however fared much worse. A combination of intercepts by our night fighters, flak concentration and bad weather lead to the destruction of 191 heavy bombers and 17 night fighters. 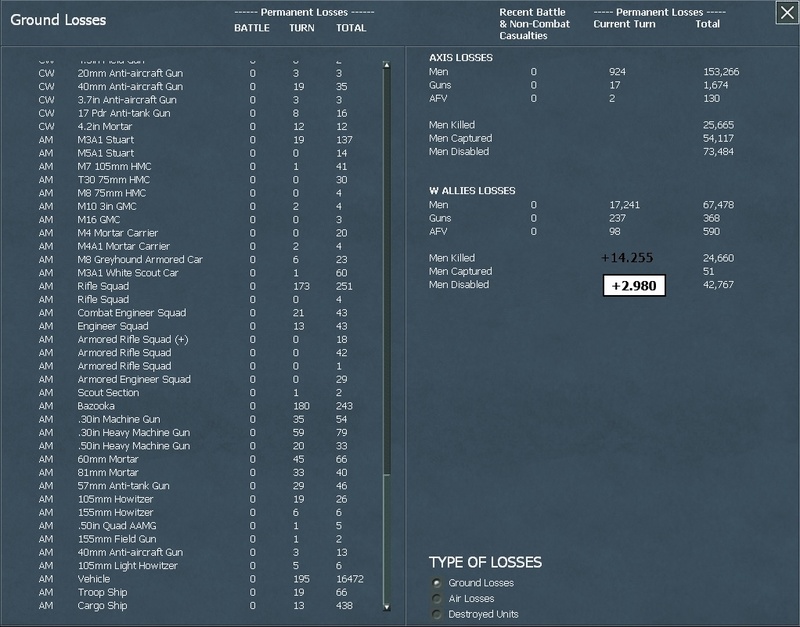 Our Flak claimed 119 of the losses. 15 Stirling III, 21 Wellington X, 43 Halifax B.II and 60 Lancaster B.I as well as other airframes were destroyed during the week. 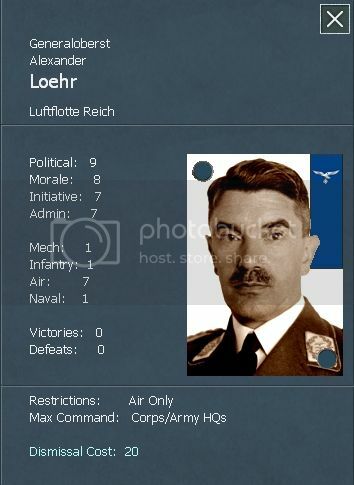 The U-Boat Pens will possibly remain a target of the Anglo-American Air Offensive in the coming weeks, so Generaloberst Lohr (the new commander of Luftflotte Reich) has ordered the transfer of additional fighter assets to the north to catch the enemy by surprise. 700 fighters are concentrated in the area. In Italy the enemy has neither launched their invasion nor made contact with out forces. Recon has detected the equivalent of a Corps in the Foggia region, Paratroopers in Sardinia and a build up of forces in Tunis (the invasion force?). However the force concentration in Italy seems to be quite small and more and more the fear increases of a possible invasion in France. This fear was reinforced after areal recon reports of a possible build up in the port of Southampton. 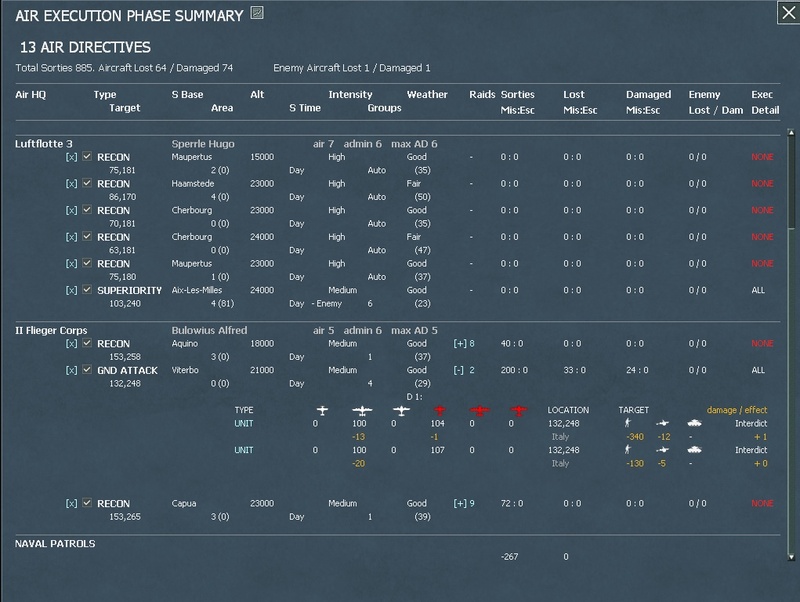 The OKH has ordered the transfer of additional recon air groups in France in order to get a clearer picture of the situation. More reinforcements arrive on the Bifena line. The whole line from Termoli to Salerno is being manned by Infantry formations with the 3rd and 15th PzGren Divisions in reserve. The 90th PzGren Division has been transferred to Rome to bolster our defenses there. The fighting of last week was the bloodiest so far and the enemy has taken a heavy blow: 600 planes are lost, of which 400 are level bombers, almost all 4 engine heavy bombers. 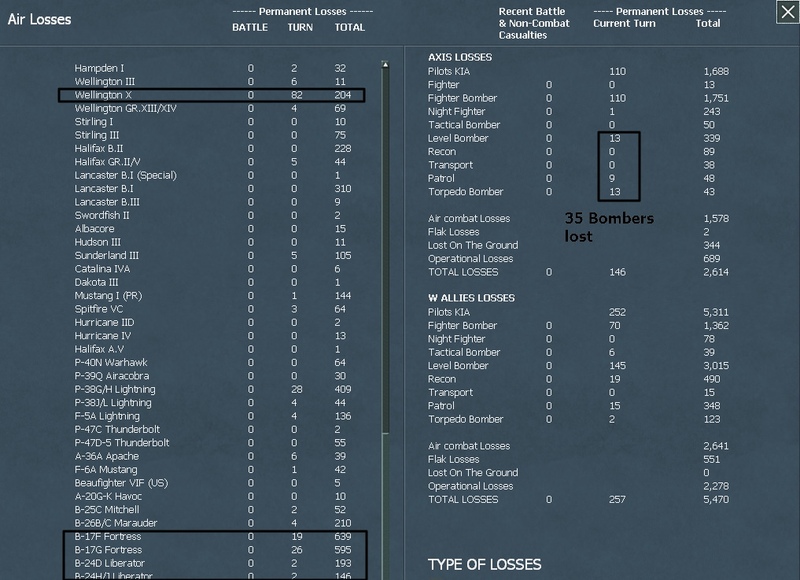 Enemy fighter losses are also heavy, 146 P-38 Lightnings are destroyed. Our losses are also quite high, 225 interceptors of all types (FB, F, NF) are lost. 146 pilots are KIA. 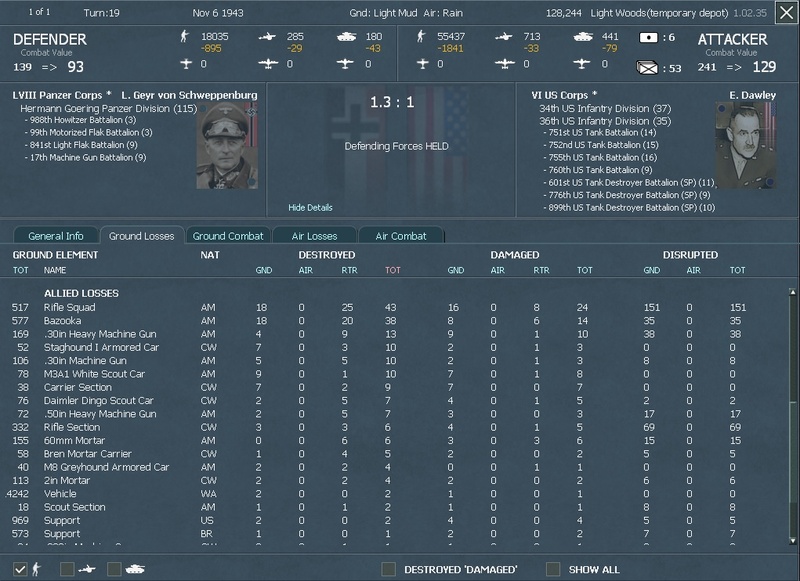 Staggering numbers, 1.774 planes in one battle. Damages to fuel refineries. 2 plants are completely out of action. Heavy damages on other locations. The RAF Bomber Command hit the U-Boat pens and level bomber factories in the north. AFV and truck factories in Hannover and Braunschweig were also hit. 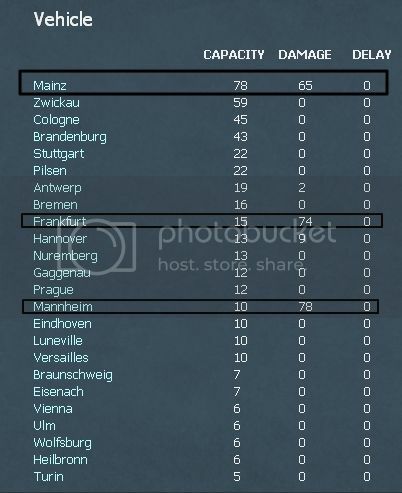 The last two cities have been reinforced with additional Flak Batteries. 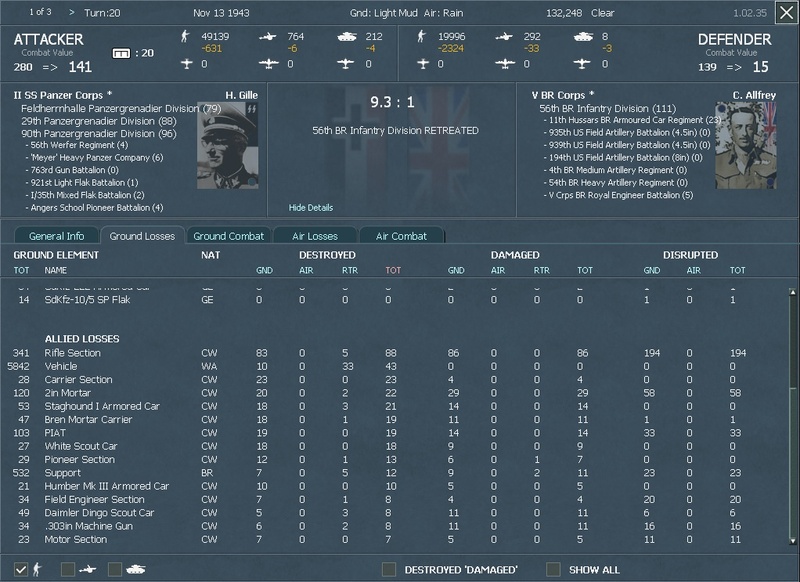 The British are targeting LB production. The He 111H-16/R1 is the second most produced LB of the LW. The Strategic Air Force stationed in Italy also made raids on Ploesti, hitting the fuel refineries there. However due to a lack of recon the Americans only inflict little damage. We destroy 34 bombers and 11 fighters while losing 16 fighters of our own, some of which belong to the Bulgarian and Rumanian Air Forces. The enemy has transferred 3 bomber groups in the Mediterranean so we will see increased activity in the Ploesti sector soon. 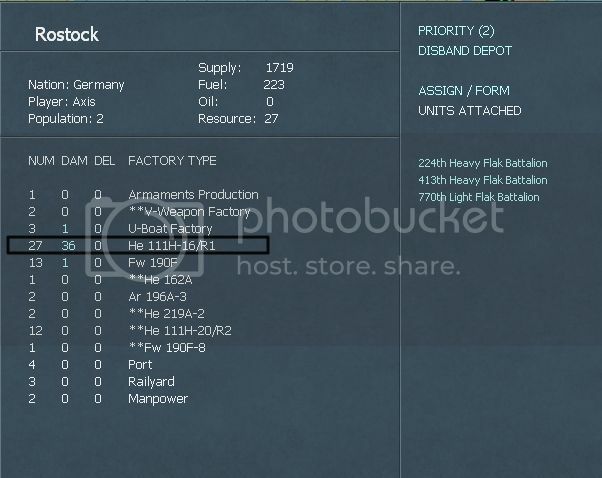 Additional AA batteries have been earmarked for the defense of the fuel refineries. 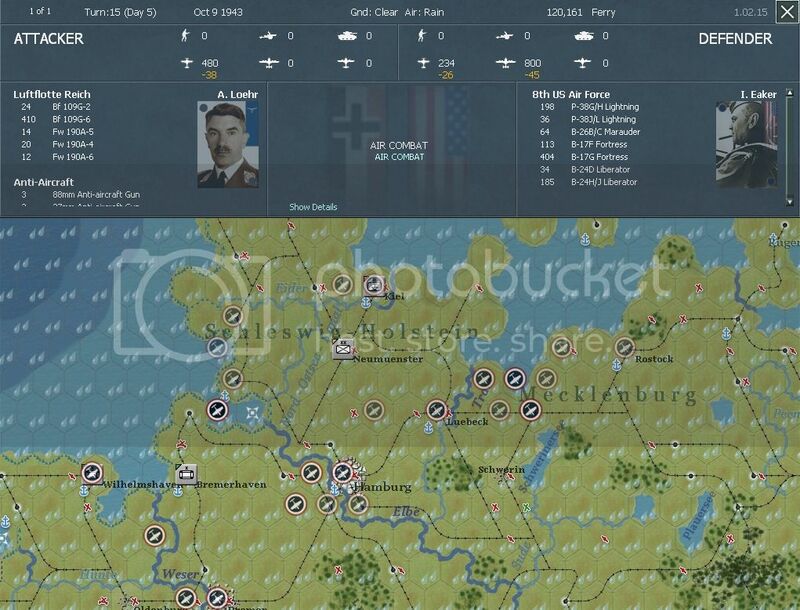 Considering the high number of enemy fighters present in the theater right now, Luftflotte Reich has decided to concentrate all fighters in one sector in order to maximise effectivnes and enemy losses. The trap has been set for the Hannover-Braunschweig area. Around 700 fighters are deployed to defend the sector. Situation remains quiet in Italy. The enemy has not moved from their positions yet. Recon over the ports of Bone and Tunis indicates a buildup of naval forces awaiting to launch the naval invasion. 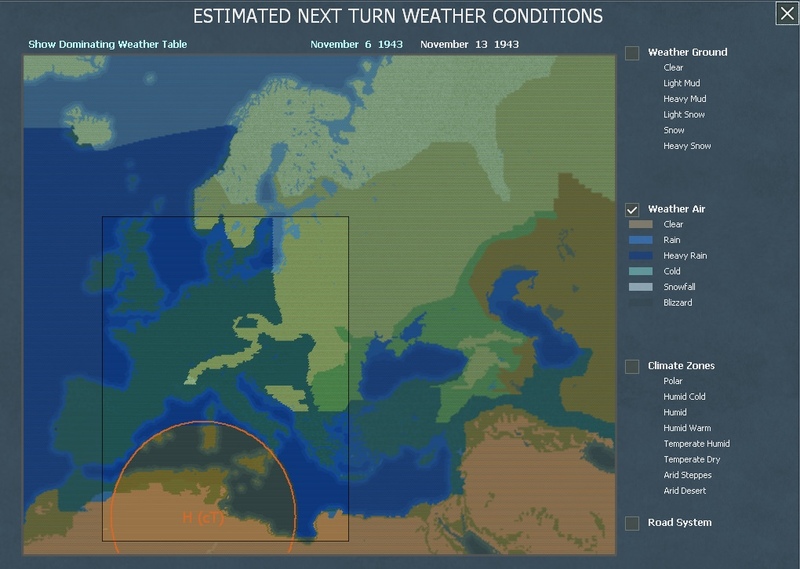 The weather is predicted to be clear for the area south of Rome next week. North of the capital, showers are expected. Army Group C is expected to lose some fighting power in the following weeks. 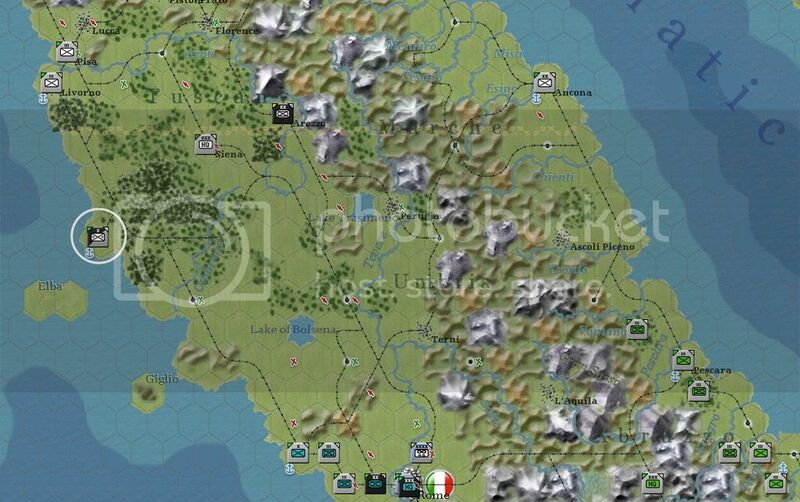 For one, the 1st SS Panzer Division, the strongest unit in Italy at the moment tasked with guarding Rome, will be transferred to the Eastern Front. 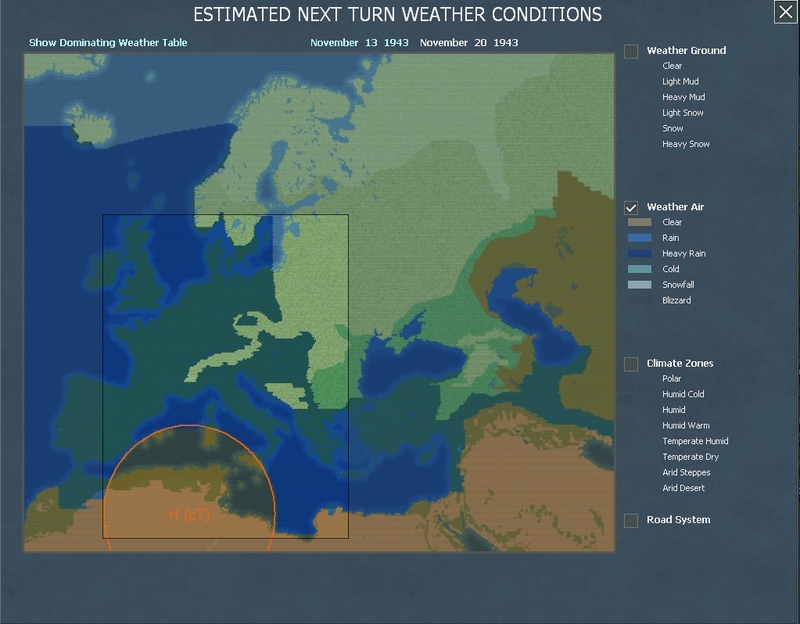 The 16th Panzer Division located near Napoli is expected to follow suit in about 4 weeks. Due to the fact that many other units are being transferred from France to the East, there is little hope that AGC will receive any new units to bolster its ranks any time soon. Status: offline Interesting AAR. Thanks for posting! 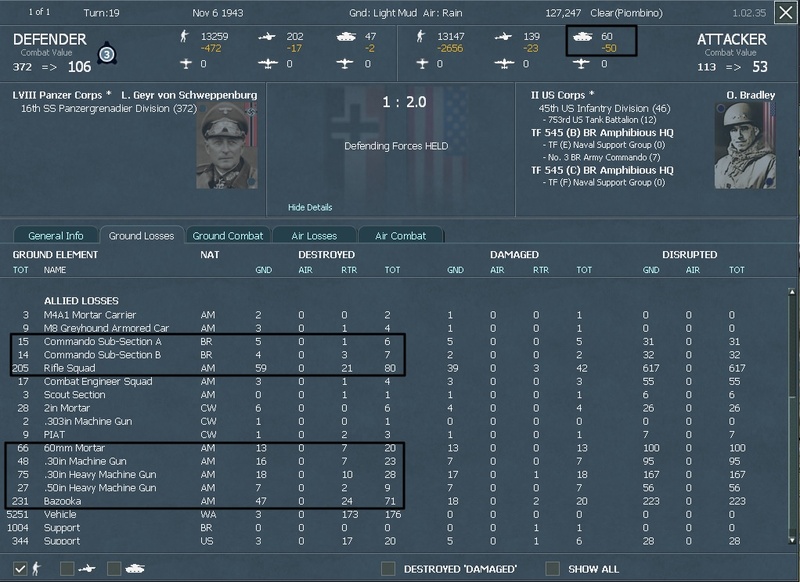 Interesting AAR. Thanks for posting! Thanks for the kind words, stay tuned! Last week, only the 8th US Air Force made an appearance over the skies of the Reich, bombing fuel plants in the north. 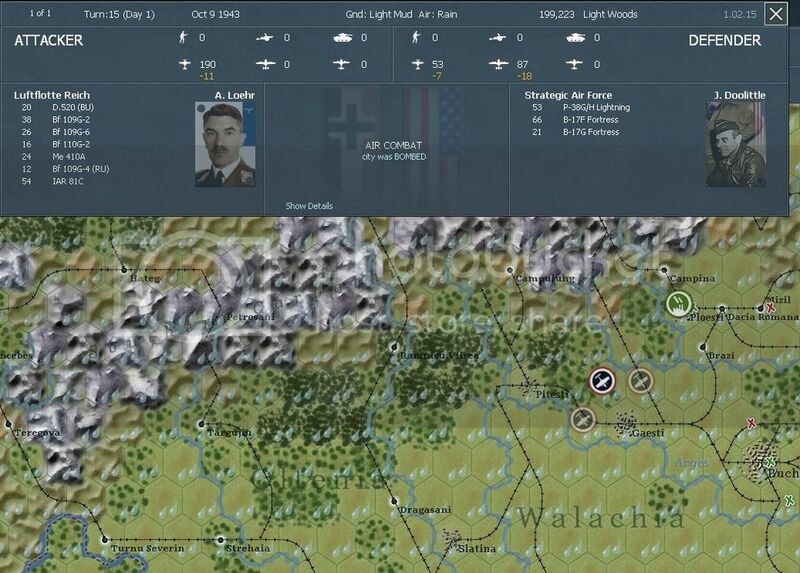 The American forces fly almost unopposed save for interceptions from the III./JG 26 stationed in the north. We lose around 70 fighters for little gains. The fuel refineries are in ruins and production has stopped. 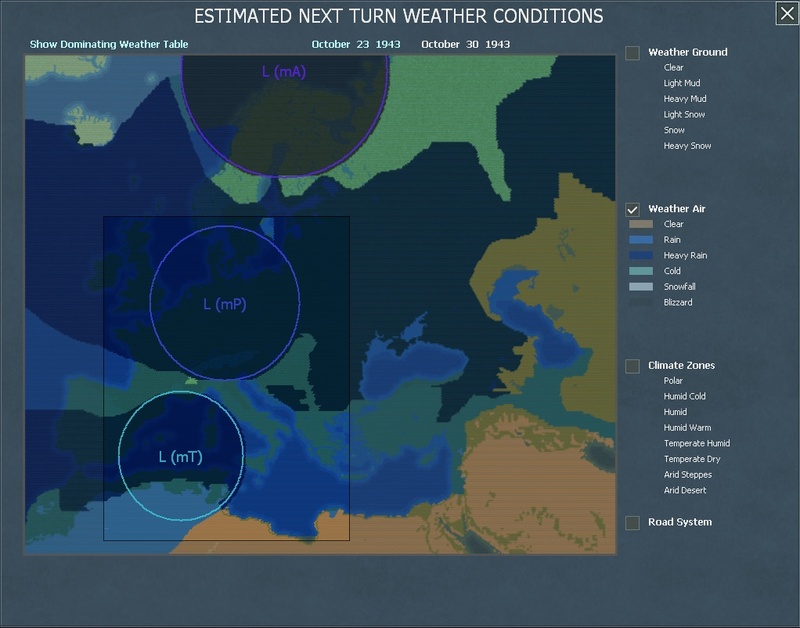 The weather over the Reich next week is predicted to be bad (heavy rains) so Luftflotte Reich will get some well deserved rest. Disclaimer: I forgot that the fighter group stationed in the north was set to day missions instead of rest. As a result the group got completely mauled by the Americans. Live and learn! The enemy has hit marshalling yards and key rail lines in Italy with an intensity not seen so far. 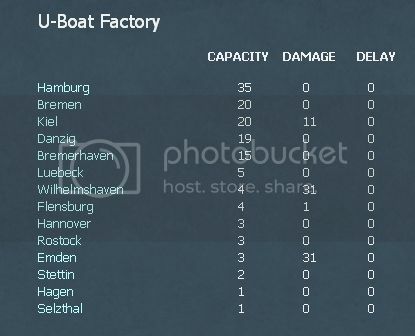 Enemy recon and naval patrols have also increased the amount of sorties. Intelligence and air recon indicates massive build up of a transport fleet in Sardinia where an American Paratrooper Division is stationed. The enemy has also moved a lot of aircraft in the Puglia area. Around 550 fighters and 350 bombers are concentrated in the sector. This is a clear indicator that the naval invasion will be launched this week. Heavy fighting is reported in the north, where the lone JG 53 (120 fighters) has to deal with the brunt of the combined American and British air offensive. The Gruppe rises up to the task however inflicting heavy casualties on the Anglo-Americans. The British chose to use Wellingtons for daylight bombing, a costly mistake: 92 Wellingtons of all types were destroyed last week. The Gruppe suffers heavy losses however: 34 fighters (28% of the force) is lost and the OKL authorizes additional fighter groups to be sent to the sector. A victory for the JG 53. Other encounters did not go so favorably for us. In Italy no major movements have happened. 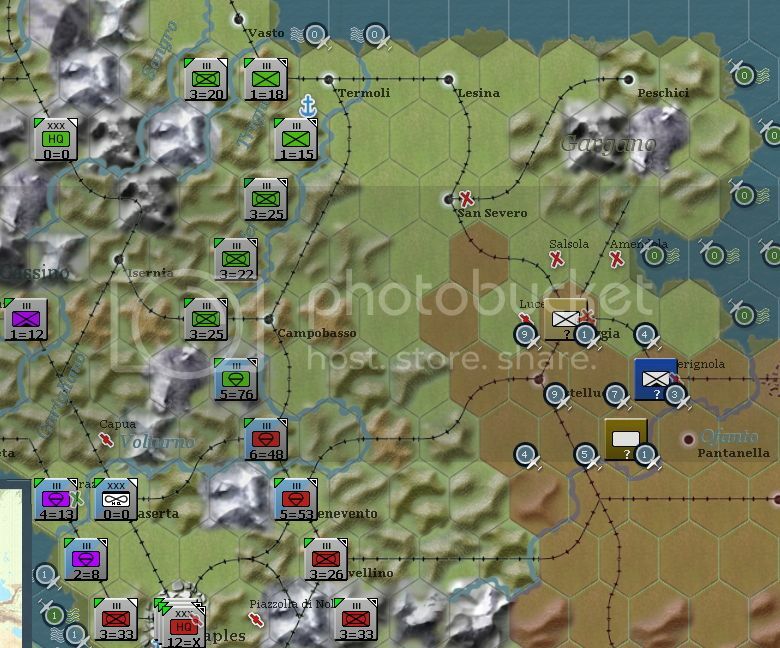 Army Group C has unfortunately lost the services of the 1st SS Panzer Division, the strongest unit in the theater. The 16th Panzer Division (stationed near Napoli) takes its place, and is transferred to Rome. 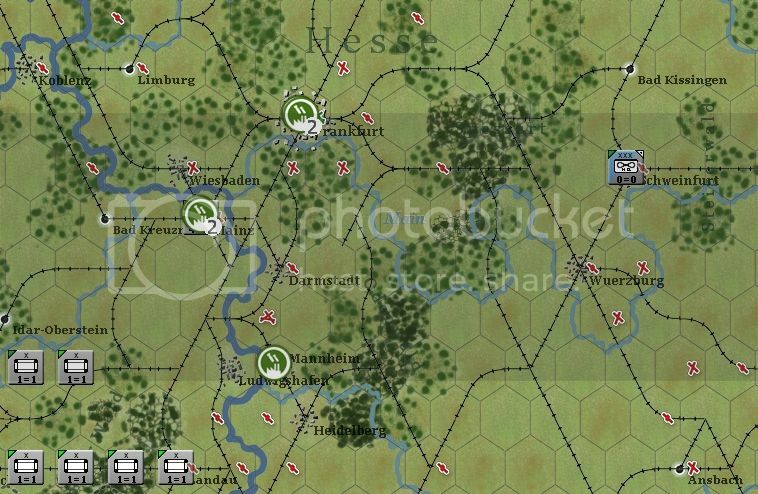 On the Bifena Line we have ''Stizkrieg'', the enemy shows no initiative to make contact with our defensive line (save for elements of the 1st Canadian Division). The Bifena Line and the Rome sector. The movement of the 16th Panzer Division shown in black. Disturbing is the increase in recon sorties in the Ancona sector, which is defended only by 1 Infantry Division, the 242nd. The terrain near the beaches here is flat, perfect to stage an invasion, but for the time being no orders to reinforce the sector have been given. The LVIII Panzer Corps will have to make do with what it has. Status: offline Great AAR, convinced me to buy the game! Great AAR, convinced me to buy the game! Thanks Bitburgerdraft, means a lot! Due to bad weather nothing happened during T18 in all theaters. T19, 6th of November-13th of November 1943. 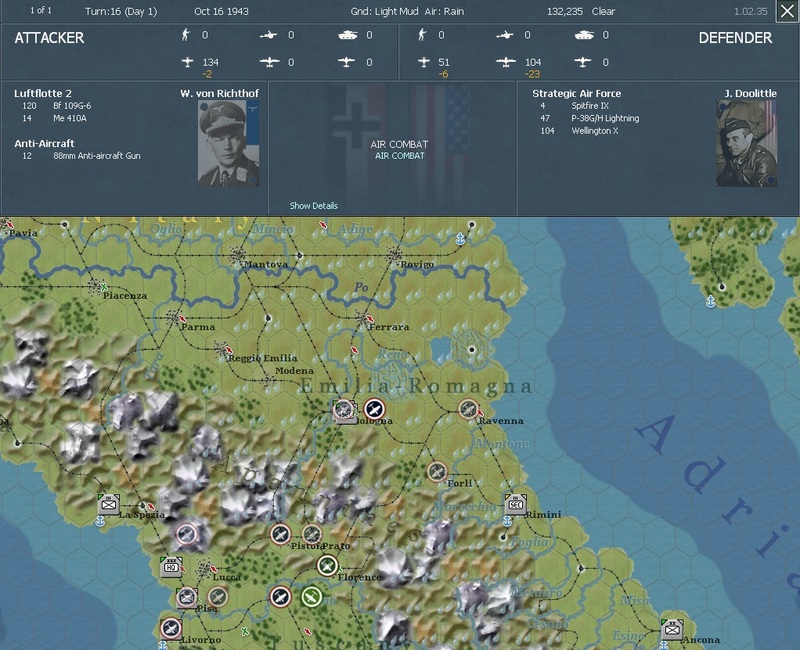 Bad weather over the Reich has grounded the 8th US Air Force and RAF Bomber Command. No raids are conducted by the enemy. Our fighter groups continue to be on R&R and operational aircraft numbers continue to rise. With the weather somewhat clearing this week, there is not doubt that the bombing will resume again. The belief is that the enemy will strike the truck factories in the Frankfurt-Mainz-Mannheim sector. To counter that, all available fighter groups that are not on refit have been transferred to the area. Around 990 fighters are concentrated here. Despite the bad weather in the Mediterranean, the Anglo-Americans have finally launched their invasion. 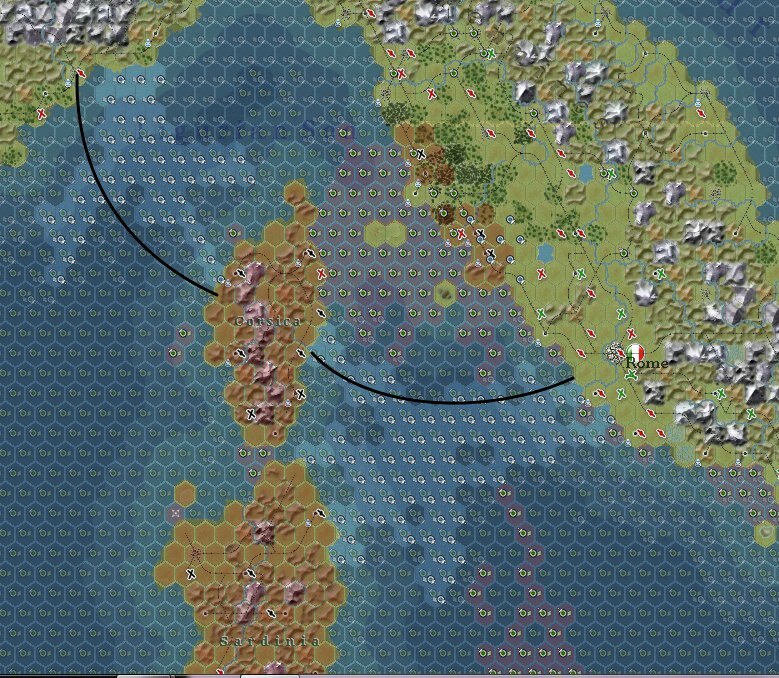 A full Army has come ashore in the Piombino sector. 10 divisions are located in the beachhead as of the start of this week. Our patrols indicate that more forces are located just off the coast, waiting to land and bolster the number of men the enemy has in the sector. The British 1st British Airborne Division has also dropped south of Piombino. The 1st BR Airborne division marked in black. The invasion has been a disaster so far for the WA. Their fleet sailed in bad weather and without air cover in sectors that our patrol planes have been mining for weeks. 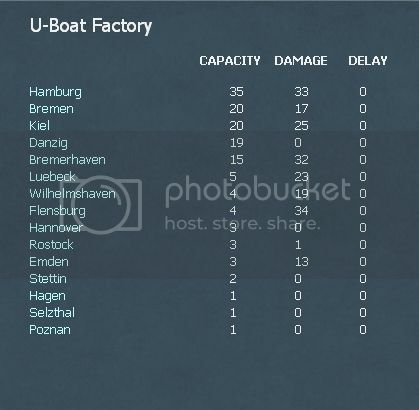 Both the weather and our mines/gunfire from the shore batteries have destroyed 19 Troop and 13 Cargo Ships. Intelligence puts the casualties at 17.000 men (14.000 of which are KIA), 340 guns and 100 AFVs. All landings were unopposed except for the one at the Piombino port. Considering the sheer strength of the landing forces, any opposition from our side would have been brushed aside and would have had no effect on the enemy. The defense of the port of Piombino port however was the right choice. Here the former 16th SS Brigade was on lager, having been upgraded to a SS PzGren division just during this week when the enemy stuck the port. The initial assault by the 45th US Infantry Division supported by the 753rd US Tank Battalion and a British commando task force caught the division off guard, but the defense was reorganized and the attack repulsed. The enemy has suffered heavy losses. The 45th has been decimated in the battle, having only half of its initial strength and will need to be refitted before it is ready for offensive operations. If the enemy is smart, he will pull the division back to North Africa for R&R. If the division remains in the beachhead, it will pull a considerable portion of supplies and manpower that would otherwise go to fighting divisions. We hope the Americans will chose the latter option. The same fate has befallen the 753rd US Tank Battalion which has been destroyed as a unit, losing 90% of its tanks in the battle. The battle of Piombino was a close call however and the 16th SS PzGren division (understrength) has suffered considerable casualties too. 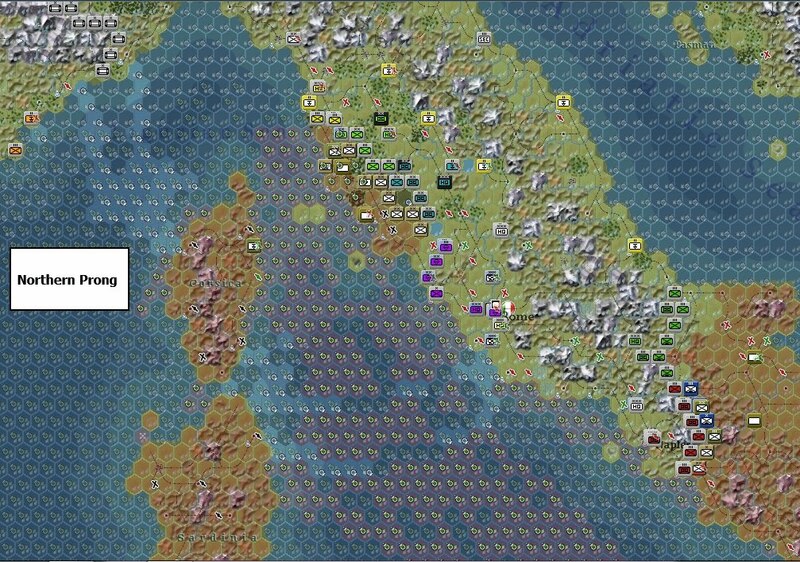 Considering the precarious situation in which the division is right now, AGC has ordered its evacuation to the east. The port of Piombino will fall into enemy hands this week. 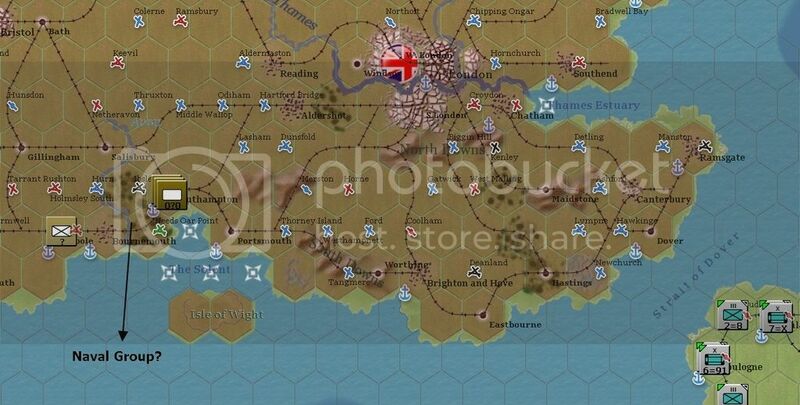 The evacuation if a tricky matter however, because the division will have to move through country landscape where paratrooper elements of the 1st British Airborne Division are spread out (level 4 interdiction). The plan for containing the beachhead right now is dictated by the necessity of evacuating the 16th SS PzGren Division. Intelligence indicates that the enemy has committed all of its naval assets to this endeavor so no secondary naval landing is possible. This frees our armored reserves to redeploy in the sector to contain the enemy landing. The plan is to move our troops as close as possible to the enemy so that the 16th SS PzGren division is protected on its flanks. 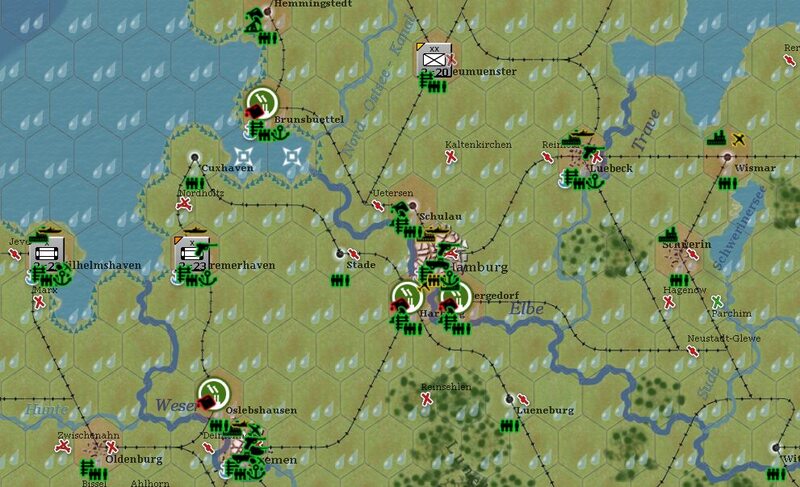 The II Flieger Corps has been ordered to interdict enemy movement out of the southern landing sector where most of the enemy formations are located. They have been fairly successful in their endeavor even though they have suffered heavy casualties in the process. The enemy forces that have landed are composed of Infantry formations of British (8 divisions) and American (3 divisions) nationality and are supported by Armored Brigade Groups. The enemy has also brought ashore with them around 400 tanks. To counter this, all three of our Corps tasked with containing the landing have been reinforced with independent Panzerjager Battalions. For supplying their forces, 5 landing sites are being used as temporary ports with cargo coming off straight from the ships on the beaches. This method of transport, is inefficient especially in bad weather. 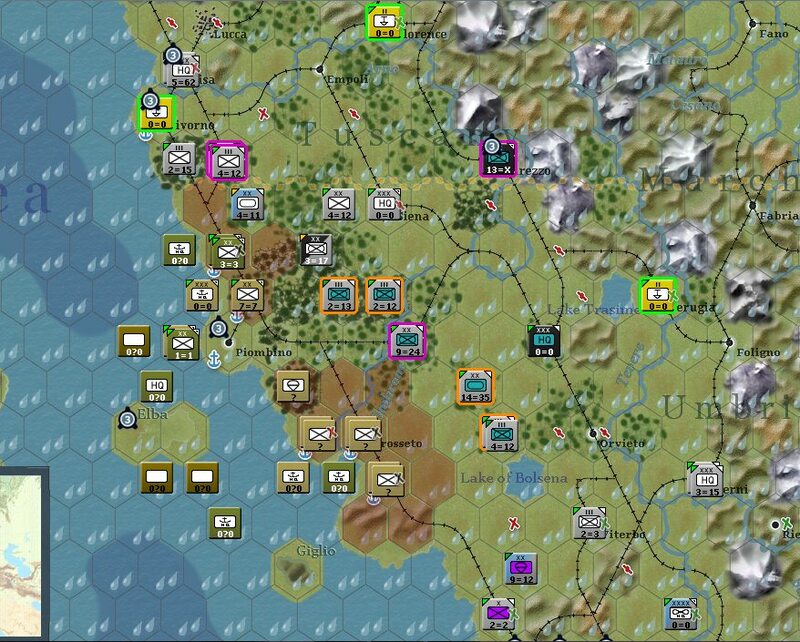 The fall of Piombino will improve their supply situation but if the enemy is contained to this beachhead long enough, this may turn into a stalemate. To cut off the supply coming in to the beachhead, Luftflotte 2 has been ordered to patrol the coast northwest and southeast of Corsica and to continue mine laying operations. So far they have been successful and the beachhead is cut off for the time being. Another raid is planned to be conducted soon. It will target the beachhead itself, in an attempt to hinder enemy movement to and from the beachhead. For this operation, additional fighter groups from Luftflotte Reich have been transferred to Italy. There is no doubt that this raid will not be an easy one, but Kesserling feels that it's a risk that we should take. 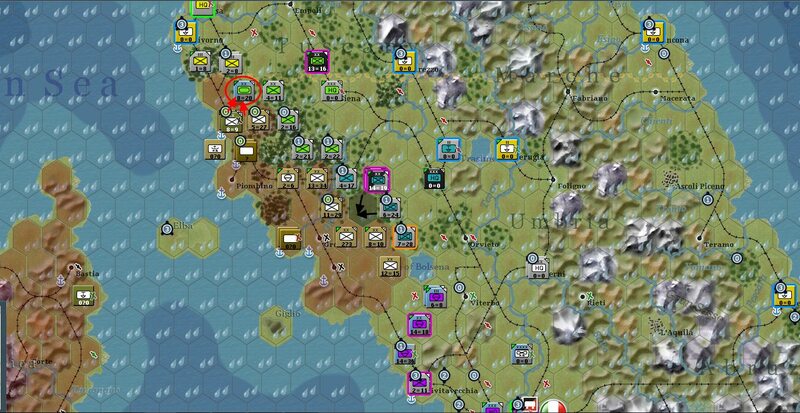 In the Bifena Line, the enemy has finally made contact with the XIV Panzer Corps defending Salerno. The 1st Fallschirmjager Division is moved off the line and is being transferred to the Piombino sector. The rest of the units take their positions on the front. The 15th and 3rd PzGren Divisions are available as reserves in this sector. 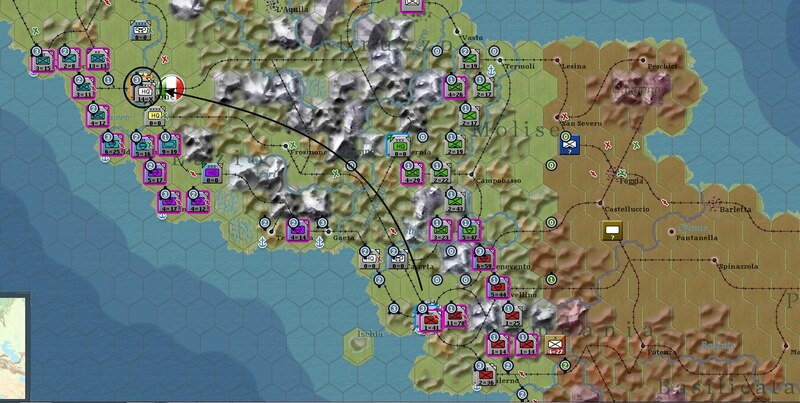 Due to units parting the front (the 16th Panzer Division will be transferred to the Eastern Front next week and the Feldherrnhalle PzGren Division will be transferred in 5 weeks) additional infantry divisions are being transferred to Italy. One Infantry division has been transferred from southeastern France to Pisa and 2 additional Infantry divisions are expected to arrive next week in Bologna. Light summer rains will continue to fall next week, and the ground conditions are expected to remain the same (light mud). Status: offline That is quite blow to the Allies! Status: online @John B: Quite a blow indeed. 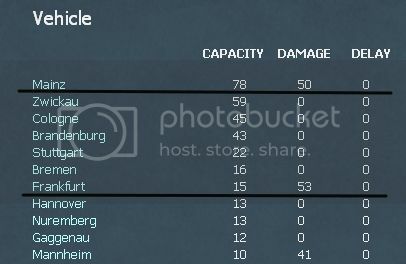 A lot of casualties taken that could have been avoided. @DanielAnsell: Thanks for the kind words! Status: online T20, 13th of November-20th of November 1943. The 8th US Air Force bombed Southern France last week in an attempt to neutralize airbases which the enemy suspects we are using to Interdict naval movement northeast of Corsica. Their bombing campaign has been fruitless as no aircraft are stationed in southern France at this time. The battered JG 301 and additional fighter groups have been transferred from Italy here for R&R and to catch the enemy off guard. The task force consists of 118 fighters. The enemy is protecting the landing zones with a lot of fighters, something that makes ground support/attack operations from the LW quite hard to conduct without proper fighter cover. The WA have hit airfields in central Italy in the hopes of destroying our bomber groups which have been harassing the movement of supply ships going to Piombino and the surroundings. Their effort has been in vain, because it was conducted under poor recon and intelligence data and also using very few air groups. The WA have reoppened the shipping lanes leading to the landing zones and our attempts to cut them off again have proven less successful than those of last week. The northern prong has managed to cut the enemy supply off, while the southern came close to it but has not achieved its goal. 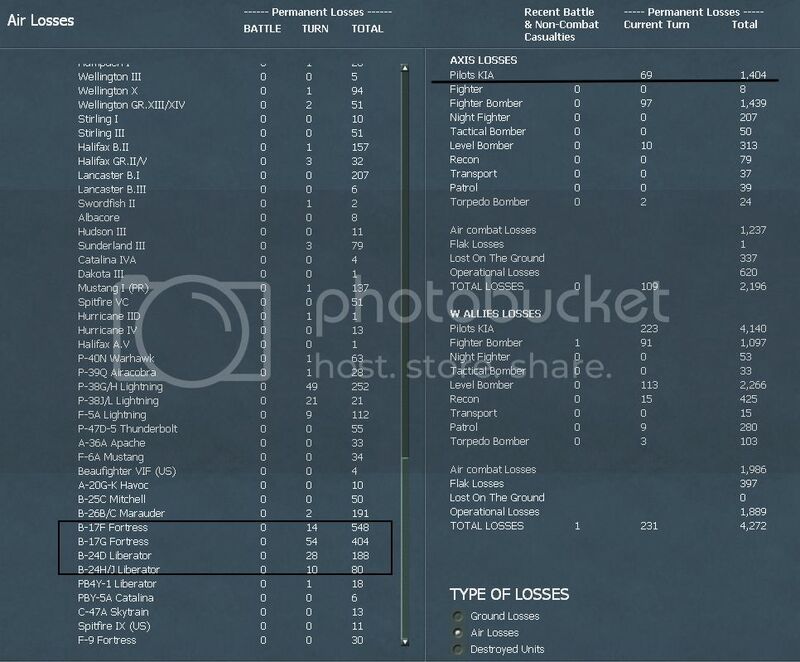 Losses are heavy, 30 bombers are lost in the operation. The heavy losses are a clear indicator that we cannot continue such operations week after week. The LW bombed the 56th BR Infantry Division, in an attempt to soften its defenses for the attack that was to come. Both of its raids were intercepted by WA fighters, which managed to destroy 33 tactical/dive bombers, depleting our close air support groups. The enemy has secured the beachhead and brought new forces ashore. In the northern sector, 2 American and 1 British divisions assaulted the positions of the HG Panzer Division but were unable to dislodge the defenders, who fought valiantly against an enemy that outnumbered and outgunned them. The clash of armor in the battle has been unparalleled for the Italian theater so far, 620 AFVs took part in the battle. Heavy casualties were taken on both sides. In the south the, II SS Panzer Corp launched a powerful counterattack, dislodging the 56th British Infantry division from its forward positions. The British took heavy losses and will probably be pulled of the line for the time being. The arriving Infantry divisions took their positions in the defensive ring around the beachheads and units have been shifted to create a tight defensive perimeter that will be hard to breach. 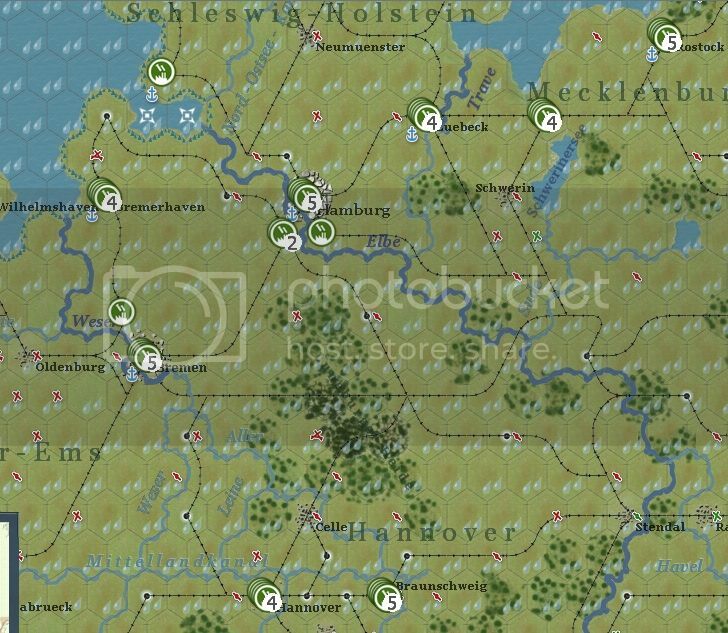 We suspect that the II SS Panzer Corps sector is the one in which the British will attempt to breakthrough, and the Corps has been reinforced with additional artillery and has been given priority in receiving both reinforcements and supplies. In the Bifena Line the enemy has moved 2 full strength infantry divisions (9th US and 8th Indian ID) in the sector of Benevento and Avellino. The infantry regiments defending these positions have been reinforced by panzergrenadier regiments. Rain is expected to keep falling next week and ground conditions will remain lightly muddy. The biggest question right now is: Where is the WA armor? Status: online Ouch, heavy losses from the landing for WAs! Weather does not help them either. I am not so familiar with the Theatre/game, but naval interdiction can cause some frustration when you get isolated by the enemy and take shipping losses or fail to close the ring on the water by a few hexagons as in T20. One question/remark I have though: There are some panzergrenadier regiments placed in rough/mountain hexagons at the Naples line. The problem is that their AFV type element CVs are divide by 4 (!) in mountains and 2 in rough area (I think), while infantry element CVs is doubled (or more). 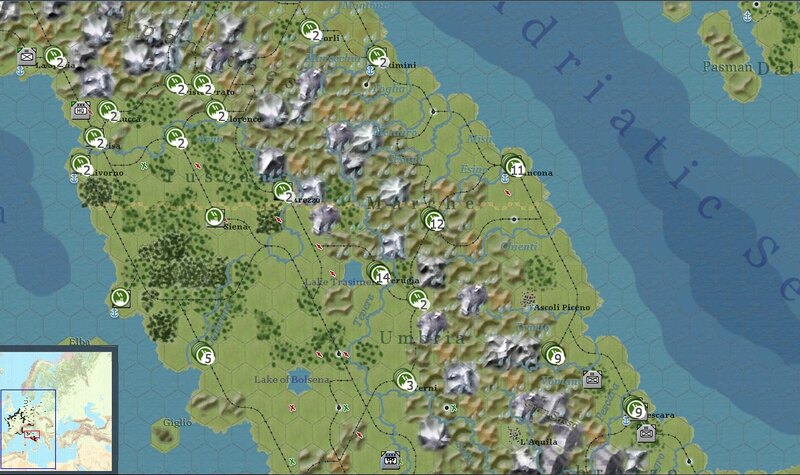 So one loses quite some CV when fighting in bad terrain with armoured units employing AFVs as compared to a set up where the armour is on the clear terrain and the infantry fights on the rough one. 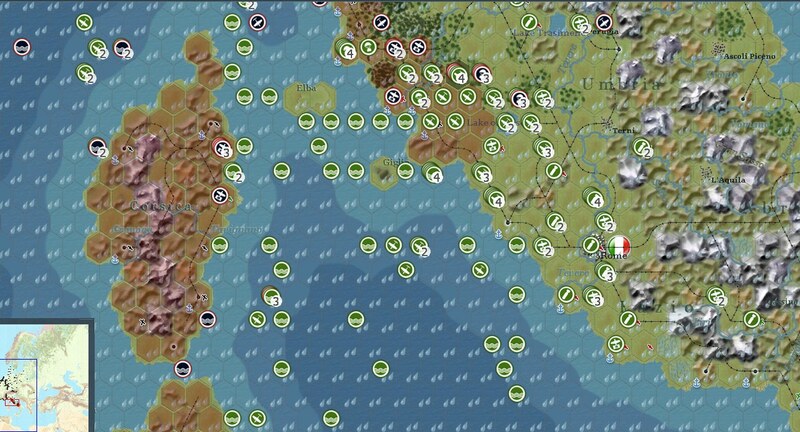 Pushing the Allies back in the Ocean is likely impossible given they have quite a number of units on shore now? You have for sure delayed them already. 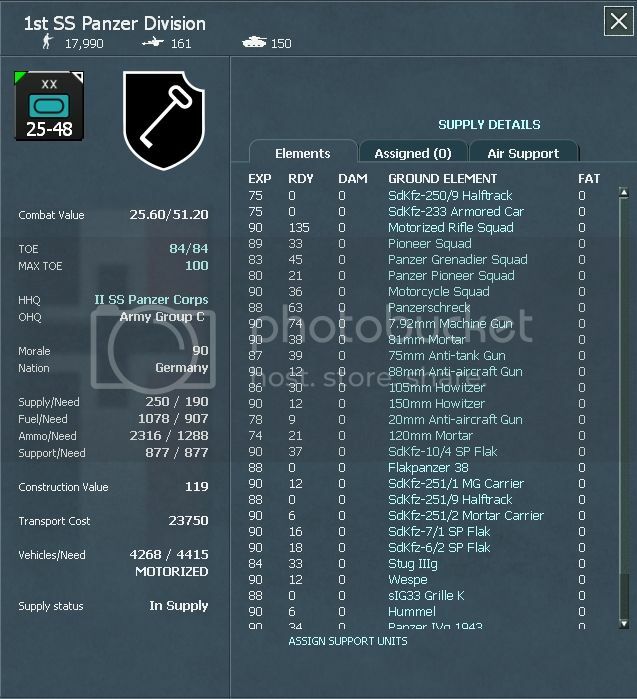 Regards and keep up the good AAR! 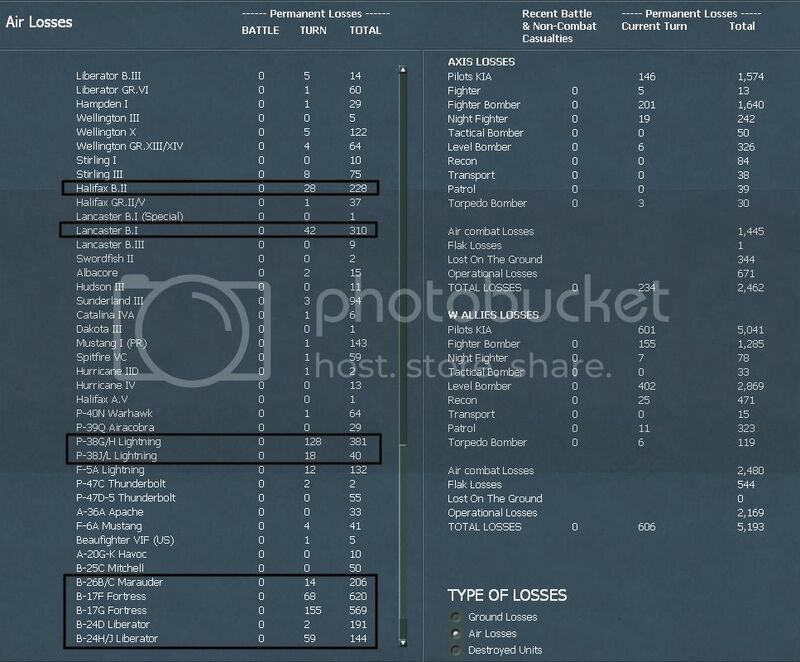 Status: online Their losses have been quite heavy indeed and they have not managed to break out of the beaches even though they have a lot of formations deployed. Armor is key here, and so far my recon of the beachheads has been bad. 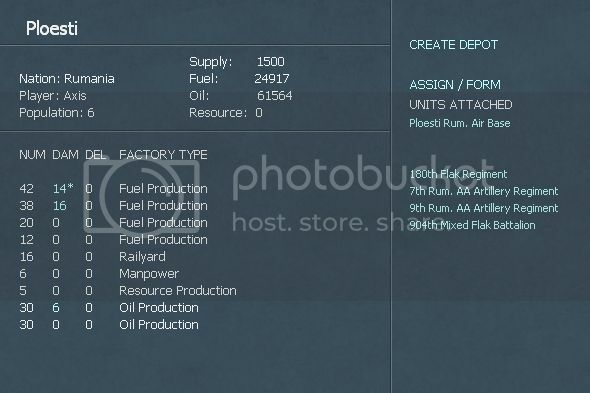 I know the enemy has brought units ashore but don't know what type of units they are. 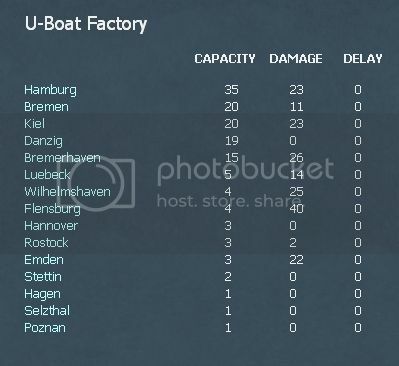 The naval interdiction aspect (as well as the ground interdiction one) are two of my favorite new features because they do a much better job than interdiction in WitE. 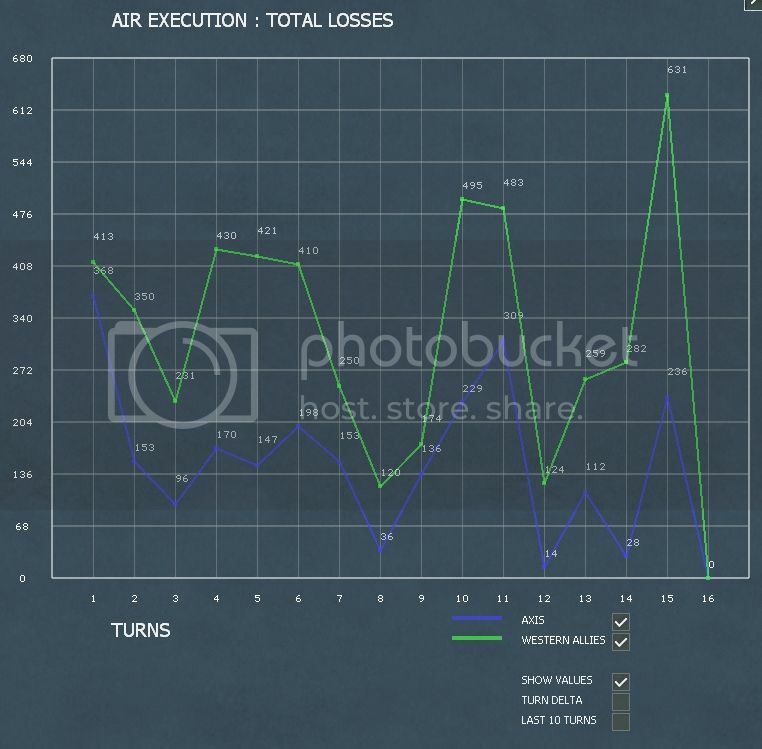 With that being said, the Allies should be doing a better job in securing their shipping lanes, but as of turn 20 they have mended some of their mistakes and I will not continue naval interdiction strikes as my bomber groups are on R&R. 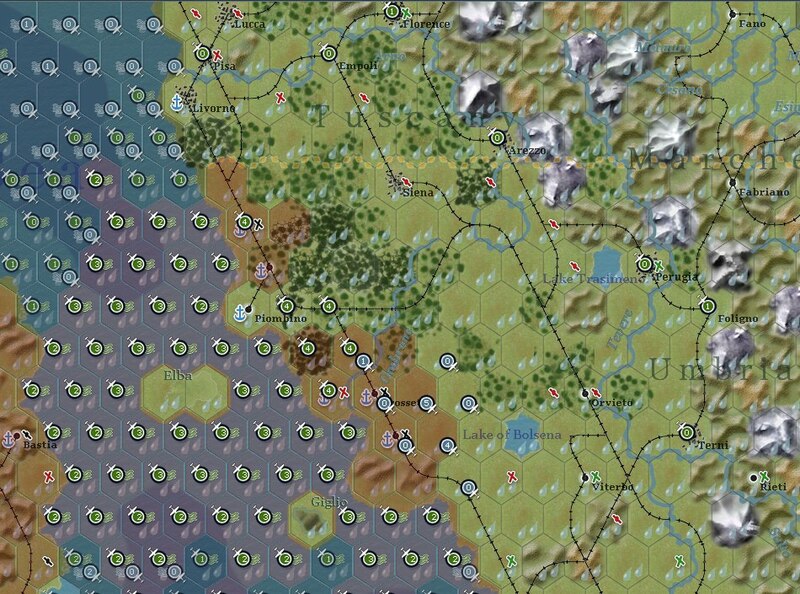 The two PzGren Regiments that were deployed to the front line are located in a city and rough hex. Both these elements have little AFVs (20 or so) present and more than anything they are there to prevent a breakthrough. 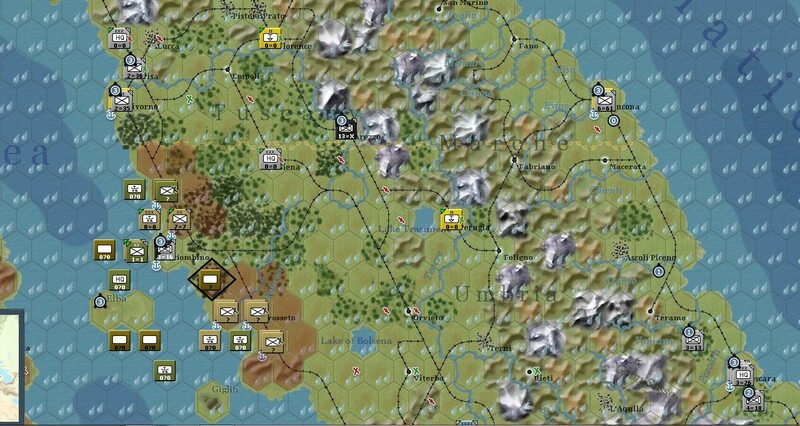 The rest of the mechanized forces in the Bifena Line are there because I have no other reserves and prefer to have some fast moving formations nearby, as the Germans did in real life. No, destroying the beachhead is not an option right now. I am hoping to contain them until the weather turns bad and their supply situation worsens. I will have to give ground if the pressure mounts though. Thanks for the comments, it's always nice to see people are taking time to read the AAR! 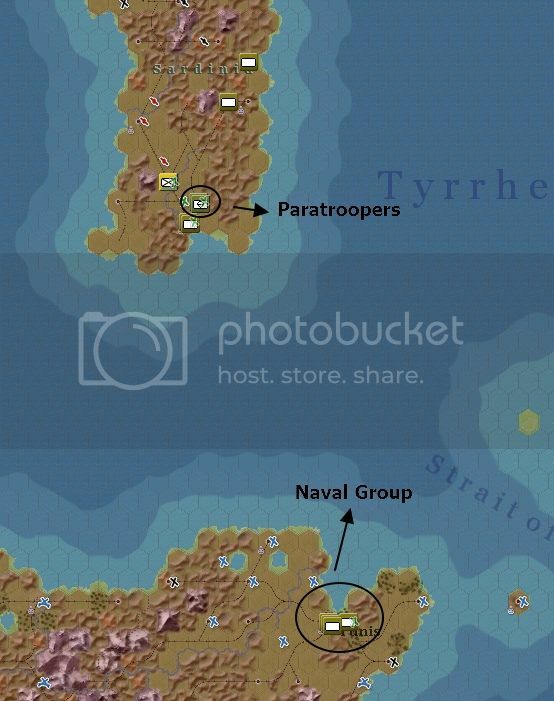 Status: offline Great AAR with all the pictures.